You are currently browsing the category archive for the ‘Hawaii’ category. Brrring, Brrring – Hawaii is calling! Don’t wait! 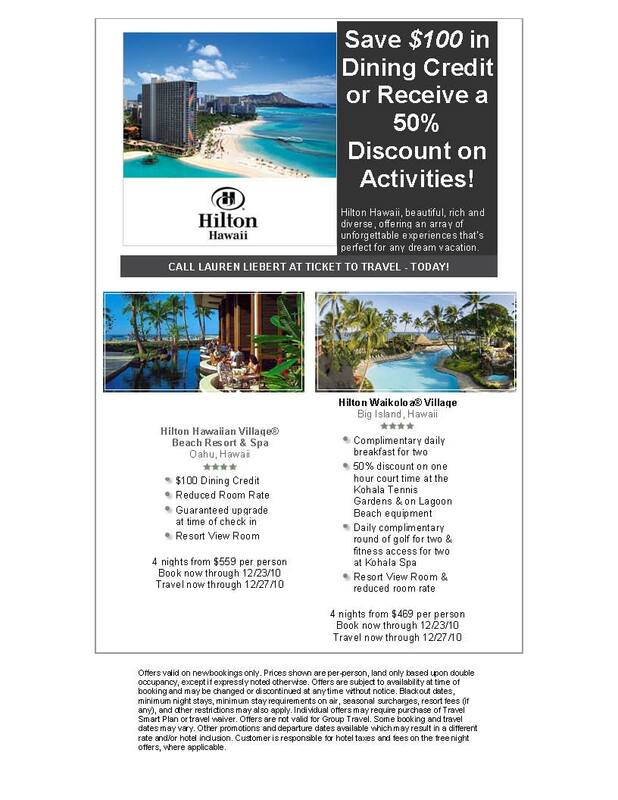 Contact me sooner than later to book your next Hawaiian vacation!!! Starting the New Decade with a BANG! November hit and then paired with my travels and the holidays, I have not been dilligent. Not to fear the deal is here! Terms & Conditions: Offer is not combinable with any packages or promotions. Five night minimum length of stay required. Offer is stackable and a $1000 resort credit will be given for EACH 5 nights stayed. 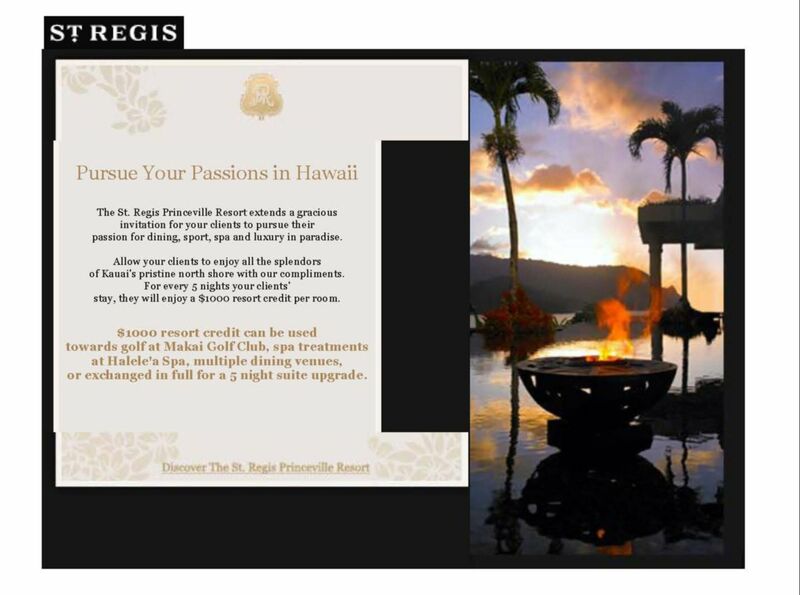 Resort Credit is applicable to Dining, Halele�a Spa or Golf at Makai Golf Club. Full Credit can also be exchanged for Guaranteed One Category Upgrade throughout Five Night Stay. Premium Ocean View or Ocean View Terrace Upgrades to Prince Jr. Suite. Resort Credit has no cash value. Unused or underused resort credit is not refundable. Resort credit may not be used for alcohol. Applicable to new bookings effective Immediately � July 3, 2010, inclusive, for travel effective Immediately � July 7, 2010, inclusive, based on single or double occupancy. Offer is subject to availability & blackout dates. This special offer does not apply on group travel. I have not discussed any Hawaii related travel, so when I saw this special today. I thought I would discuss it briefly. Resort View Room – 4th night free; American buffet breakfast daily at the Palm Terrace restaurant for a maximum of two guests per room; Daily Aloha Fun Pass per room, per day. If you haven’t been to this resort, you are missing out! It is Hawaii’s version of Disneyland. Located on the Kohala Coast of the Big Island of Hawaii, the extraordinary property offers an unforgettable experience shrouded in breathtaking gardens, rich wildlife, and tranquil waterways. This complex stretches out for a full mile and embraces 62 acres of lavish gardens, lagoons and electronically controlled waterfalls. Guests chose between trams or the favored mahogany cabin cruisers to get around this huge site. The village offers a dolphin lagoon, a saltwater swimming lagoon, two large pools, and an adults-only pool. For those looking for a fantastic location for a Destination Wedding – stop looking any further!!! Immerse yourself in island culture and tradition with a truly inspired destination, offering an authentic Hawaiian experience in an unforgettable oceanfront setting. There are several wedding packages and a wide variety of reception venues to choose from. The options are endless.